on the 23rd of April. If you know of anyone who would like to learn more about social media, branding, creative business etc then please let them know about this course. For more details on what the course covers - click here or email me. 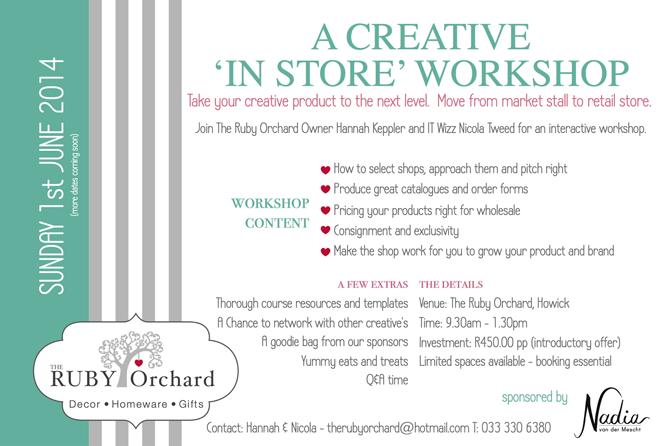 This wonderful workshop is going to assist so many creatives to grow their businesses and brands - thanks to the wonderful (and clever) Ruby ladies. I'm honoured to be involved and can't wait to meet the attendees. I'm so excited to be speaking at this awesome event in Joburg on the 9th and 10th of July. Tickets are on sale and the event is set to be jam-packed full of learning! For more info or tickets - just click here. P.S. : I am working on additional workshop dates for Joburg and Cape Town. I'm just checking when would be best and which venues will be suitable. Watch the space! Be sure to email me to be added to the waiting list and be the first to know when the dates are released and ready for booking! One on one sessions will be R275 (R100 discount) for two hours. Skype / Facetime sessions will be R200 (R100 discount) for two hours. The deal is only valid if you book and pay for your session before the 10th of April. Your session, however does not have to take place this week. *Deal open until close of business on Wednesday 9th April).